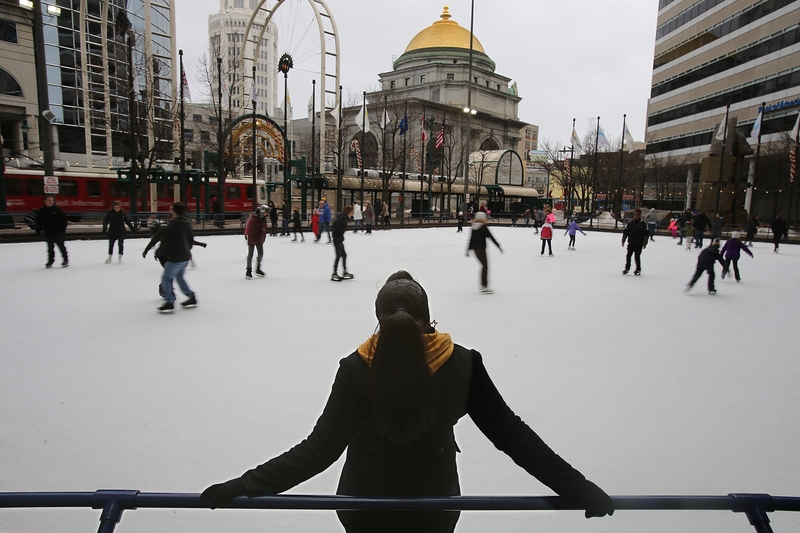 A skater takes in the scenery at Rotary Rink in downtown Buffalo. As housing development quickens, more people are returning to the city from the suburbs. In “The Great Inversion and the Future of the American City,” the former editor of Governing magazine, Alan Ehrenhalt, explores the latest demographic trend: affluent and professional suburbanites flocking back to live in central neighborhoods in large U.S. cities, lured away from suburbs by trendy shops and restaurants, nightlife, walkable neighborhoods, short commutes and the romance of an urban lifestyle. The result is a broad social reorganization of metropolitan America, undoing nearly a half-century of suburbanization and white flight. The trend, however, will mean different futures for different cities, and it might be in its infancy in Buffalo. Housing development is now quickening, with many active projects – including the HUB Apartments, Larkinville, Buffalo River Lofts and the Tishman Building –with even more on the way. There is a stockpile of commercial and industrial buildings suitable for renovation for residential living. At the heart of the matter is an astounding role reversal between central cities and their suburbs. As affluent and creative people return in large numbers to cities, low-wage workers and immigrants are consequently priced out and settle in suburbs. The shift can be explained by several factors: the general aging of the U.S. population, family composition trends (lower marriage rates, fewer children and families), higher energy prices, a notable decline in violent urban crime and success of cities in creating thriving downtowns and districts where people want to be. Interest in “green” development and sustainability initiatives is growing, which makes compact, walkable places more attractive than sprawling suburbs where owning an automobile is a necessity. The same trends are affecting Buffalo, where we may be seeing a reversal of the suburbanization that gutted many of the city’s stable neighborhoods and nearly its entire East Side starting in the 1950s when inner- and outer-ring suburbs prospered. During the latter half of the 20th century, Buffalo’s downtown core housed a population negligible in size. It was not until the 1990s that new residents began settling in downtown, and that pent-up demand for an “urban lifestyle” led to long-term planning for reintroducing a residential component. But new housing – mostly aimed at middle- and high-income workers – has not been added in a sufficient quantity or concentration to allow a residential neighborhood to emerge. As a result, residential living in or near downtown Buffalo is scattered, unconnected and lacking basic service amenities. Institutions focused on the center: The University at Buffalo is moving closer to the center, constructing a $375 million Medical School on its downtown campus. Economic development: Critical to the success of Gov. Andrew Cuomo’s “Buffalo Billion” is attracting private-sector, middle-wage jobs and locating them where people want to work. Up to 3,000 newly created jobs could be added on or near the medical campus. City planning: Buffalo’s new Green Code will employ New Urbanist and smart-growth principles to produce dynamic and sustainable urban spaces featuring green infrastructure and clean energy. Walkable, mixed-use neighborhoods serve as the building blocks. Housing value: As of December 2013, Buffalo led the nation in home value appreciation, an honor that for decades seemed unthinkable for the region. Slow but steady valuation occurred in Buffalo during the last 10 years while other parts of the nation experienced housing booms and busts. Demographic and population change: The Buffalo metropolitan area is an aging region, with higher-than-the-national-average share of residents over age 65. Many retirees and empty-nesters will be attracted by the exquisite housing stock and convenience offered in Buffalo neighborhoods. In the largest U.S. cities, like San Francisco and Washington, D.C., the demographic inversion is displacing low-income families and working-class people, and quickly inflating prices in central cities – especially housing costs – to unaffordable levels for many. In Buffalo, the demographic inversion could help the city fill urban places that have long been empty and finally establish new neighborhoods downtown and nearby. If and when the demographic inversion manifests itself in Buffalo, we must welcome new urban pioneers and also seek to retain neighborhood diversity and affordability. With more active construction and more announced projects now than have been seen in decades, there is momentum in Buffalo, especially downtown. Perhaps the growing Buffalo Niagara Medical Campus and environs provides a microcosm of urban change by establishing a common meeting ground for the affluent Allentown and neglected Fruit Belt, centered around a reconfigured Metro Rail station (finally giving Buffalo’s beleaguered Metro Rail new importance). Here, there is much potential for employment growth – low-skill, middle-wage and high-income – and walk-to-work residential settings. If what Ehrenhalt says is true, the great inversion is an unstoppable trend that will happen everywhere, although it will occur more slowly (“very gradual and attenuated,” according to Ehrenhalt) in cities in decline like Buffalo. Therefore, we will surely have to adjust our perceptions of cities, suburbs and urban mobility. Daniel Baldwin Hess, Ph.D., is an associate professor in the Department of Urban and Regional Planning at the University at Buffalo.